Do you ever go through spurts where you become somewhat obsessed with something. I remember when "Crouching Tiger, Hidden Dragon" came out, I loved it. It made me want to learn Mandarin and calligraphy. 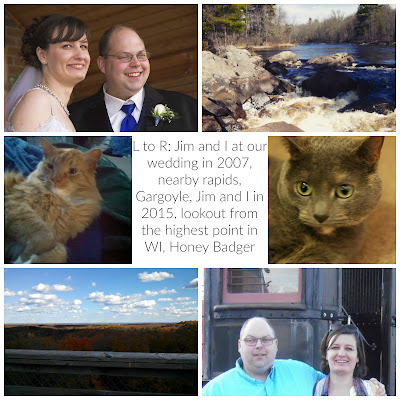 (Surprisingly, not martial arts but I live in rural Wisconsin. It'd be much easier to buy a cow here than find anyone to teach me even basic karate.) I fell in love with the soundtrack which lead to a love of Yo Yo Ma. I watched several more period martial arts films, but "Crouching Tiger" was always my favorite. And, thirteen years later I still have a soft spot for it. Anyhow, my latest semi-obsession (now that I'm older, it's harder to get totally absorbed in a movie, type of music, or book, things like work get in the way) is with Sherlock Holmes. I read The Sign of Four and The Hound of Baskervilles years ago but I cannot even remember what I thought of them. I think I liked them, but I never got any farther in my Sherlock Holmes canon. I watched both movies starring Robert Downey Jr. and Jude Law, but they didn't really impress me. Then I started getting interested in the BBC "Sherlock" series. I got hooked after the first episode of season 2 on PBS and immediately went back and watched the first season on Netflix. 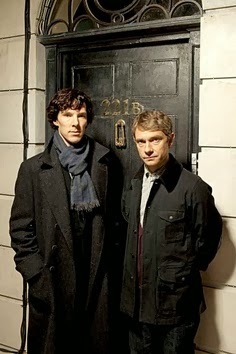 Sherlock is the genius with very little social skills. He can be unkind and even somewhat mean, but John Watson is there to call him out on it. I really like Watson and this series does a good job of making you like both characters and really care about what is happening to them. Andrew Scott plays Jim Moriarty. He's a bad guy, but a smart bad guy. I like that he's not some brute running around with a gun. He's conniving and twisted and played in a way that you will totally love to hate him. This series holds the original stories close and just puts it's own twist on them. Word on the street is Season 3 will release in 2014. Since I enjoyed this series so much, I decided to give "Elementary" a try. It's a show on CBS. I don't get CBS, but Season 1 just released on Netflix a few weeks ago. 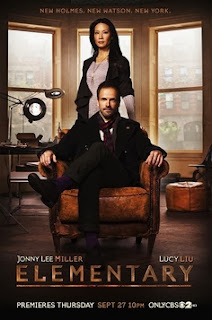 Johnny Lee Miller plays Sherlock Holmes, a recovering drug addict who has moved to New York for a fresh start and is consulting with NYPD. Lucy Liu plays Joan Watson, a doctor who lost her medical license and is hired by Sherlock's father to be his "sober companion" and keep him on the straight and narrow. I really like this series too, and if I had to choose a favorite between the BBC Sherlock and Elementary, I don't know which I'd choose. I like that Watson is a girl in this series, yet her and Sherlock aren't making googly eyes at each other. They do have chemistry though, it's just more of a platonic best friend kind. Sherlock has more charisma in this version than in the BBC's, but he can still be obtuse about feelings at times. I'm almost through with the first season, and really enjoying it. This series uses it's own cases, so there's no retelling of an Conan Doyle tale here. Finally, I found The Sherlockian by Graham Moore at the thrift store on one of my explorations with my friend Lori. It looked intriguing and I figured for a buck, it'd be worth a chance. This book is about a Sherlock Holmes superfan investigating the murder of a Holmes scholar as well as Arthur Conan Doyle investigating the murder of some young women suffragists with the help of his friend Bram Stoker. Each chapter alternates between the two stories and ends by tying the two together. 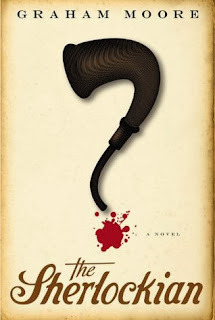 It was an interesting read and I learned a lot of Sherlock Holmes facts as well as some about Arthur Conan Doyle. If you're a Sherlock fan I think it's worth the read. It's not life changing, but it is entertaining. So, anything that has lead you down a rabbit hole lately? You could be me talking. I watched Sherlock on a whim and then marathon-ed through the 6 (SIX?!?) episodes. At least each episode was movie length. When I heard of Elementary I knew before I'd seen a single episode that it was different enough that I could love them both. Have you seen where Cumberbatch and Miller starred as Frankenstein and His Monster in the UK - they alternated rolls (switched between the Dr. and the Monster) and then they are both Sherlocks! I just thought that was too cool. I didn't realized that they had acted together! That is cool. I found a clip of it online. Thanks for pointing that out! There's a Sherlock Holmes convention happening in Seattle this month...maybe there's one somewhat near you? I was like a terrier with a bone for Game of Thrones, and Doctor Who, but we don't have TV service (and can't afford Netflix) so that slows us down a bit in watching shows.